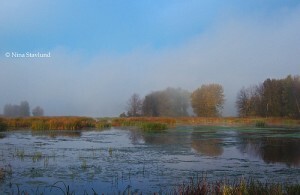 It was a misty morning at Petrie Island, Always An Adventure's first official birding excursion this fall. The fog lingered a bit thorough the first hours of the day, but vanished and gave room for blue skies and sunshine. We had Merlin, Rusty Blackbirds, Green Heron, American Bitter and a young Bald Eagle at Petrie to mention a few species. At Giroux Pond it was Killdeer galore, in addition to Greater Yellowlegs, Dunlin, American Widgeon, and 3 Wilson's Snipes. Venturing through the back roads and farm fields, we had Sandhill Cranes, Coopers Hawk, American Kestrel, White-throated and White-crowned Sparrows.